Shimmering, Shining and Serving for 25 years! 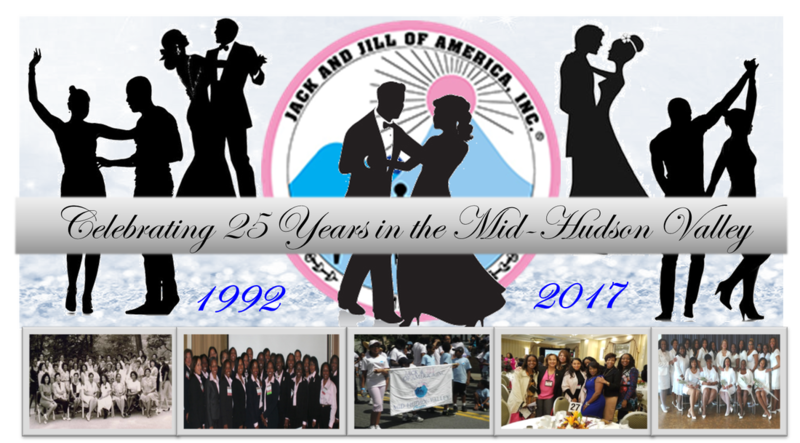 On October 17, 1992 the Mid-Hudson Valley Chapter (MHVC) was installed as the 218th chapter of Jack and Jill of America, Inc. serving the Mid-Hudson Valley areas of Dutchess County, Putnam County and northern Westchester County, New York. ​On October 17, 2017 will mark the Chapter's Silver 25th anniversary as we celebrate our 25 years of shimmering, shining and serving in the Mid-Hudson Valley region. Home of the Eastern Regional Secretary Margaret Gibson and the Eastern Regional Teen President, Audrey Watt, the Mighty Mid-Hudson Valley Chapter invites you to join us for our 2017 Gala Fundraiser "Adults Only" night of dinner and dancing! Spend an elegant evening in an exquisite setting while enjoying cocktails at our open bar and four-course dining on culinary delights! A Silent Auction and special musical guests will enhance this memorable occasion! years of service to the area on October 17, 2017. We would like for you to participate in our Souvenir Ad Journal, which will encompass a historical perspective coupled with advertisements from our supporters. · All ads should be “camera ready” in .JPG, .PNG, PDF, or Word Format. · Black & White or color photographs accepted. · You may wish to use one of the following fonts for your ad copy “Bookman” or “Times New Roman”. Proceeds from the Gala Fundraiser and Silent Auction will benefit the Children's Home of Poughkeepsie, The Family Resource Center of Peekskill and Jack and Jill of America Foundation – an organization that empowers young people to build the leadership and character based skills to lead impactful philanthropic initiatives like this fundraiser. Please click on our Beneficiaries logos below to learn more.